Nnorom: Obi, I have to tell you, it is an honour to have you as my guest for December 2002. This month is very important in the development of my work. To begin with, Sentinel Poetry Movement which I have just founded has now come alive and new online Sentinel Poetry Magazine has now gone live. All these at a time we have Christmas in the air and Esiaba Irobi - the Minstrel himself coming to London for a big poetry bash among other things. It is an exciting time for me and I am joyful beyond words that your work will form a big part of these end of year activities. My visitors will want to know more about you as they read your work. Let's begin with the basics. Your name is Obi Nwakanma. Do you write under any aliases? Obi: Yes, of course. My name is Obi Nwakanma. I have never had any need to write with a pseudonym, except perhaps once, when I had to publish a piece in a Nigerian newspaper, just to avoid a conflict of interest with The Sunday Magazine, (TSM) where I was a staff writer. I'm comfortable with my name. Anything, I think, that I feel convinced enough to say, ought to have my signature, and without the ambiguity of an alias. It is a matter of conviction. Not that I have anything against using a pseudonym when it is expedient to do that. In fact, in the difficult terrain that I've had to operate as a journalist, that is Nigeria under the military dictatorships of most of my professionals years, that need was possible, and quite expedient. But I've always chosen to put my name alongside my conviction. Nnorom: I know what, you mean. I too have rejected suggestions to write under an alias, to use a more pronounceable name. More about you. Where and when were you born? Obi: I was born on December 18th, 1966 in Ibadan, Nigeria. I'm of that generation born under the dark, terrifying eve of war, and violence, and we have never really known true peace. And that perhaps tells significantly in the way my work is shaped, in the things I've chosen to write, and in the ways I've chosen to write them. Nnorom: Did you get any help or formal training in the art of poetry writing? Obi: Well, I took an honors degree in English at the University of Jos. That's as much help as anyone could get. I was very involved in, helped in fact to establish the writing scene at the University of Jos in the 1980s. That led to a ferment, and that ferment has led to what we are beginning to see emerge as the Jos school, among whom would be numbered a chap like Helon Habila, who just won the Caine prize. He came to Jos after I left, but the movement we started was alive, and he was a product of this too. In the writers group in Jos, we read and critiqued our works. So in fact, the best training for poetry, for writing in any genre is reading, reading, and reading. Reading especially one's contemporaries. One must see the movements, the arguments, the divagations, and then find an imaginative anchor within it all. Nnorom: How did you get to develop an interest in poetry? Obi: Well, I'd always grown around books. My father had a decent library. My mother was a school mistress, and there was always the contact with books. I read my mother's copy of Arrow of God, the first of the Achebe books that I read, in primary four. It was in the same period that I read Ngugi's Weep not Child, and Alan Paton's, Cry, the Beloved Country. Very early, and my fascination for literature grew out of that contact with materials always lying around. I quickly devoured my father's newspapers, whenever he returned from the office. Very early on, way earlier in primary two, I was already reading the Drum magazine, which came out of South Africa, and was quite taken by the detective comic, Spearman. But on arriving the Government College Umuahia, which had a fairly well established literary tradition, I realized that I loved to write. It was easy to get into the Stone library, and see all those books, and in time, I easily took to poetry. Reading Okara, Soyinka, and especially JP Clark's poems, and the other modern African poets who were introduced through the school curriculum. Umuahia had great teachers, and somehow, they made the poems - whether it was the late English master, Mr Abosi teaching Chaucer or his favourite Shakespearean sonnets, or the Indian Unni, comparing a cricket late cut to perfect poetic delivery - poetry seemed to come alive for me. I was not particularly an orthodox student, but I was happiest editing the Simpson House magazine, "The Dewar" and later on "The Umuahian (Red Star)." And I realized in those days, that I wanted to be a writer. My greatest epiphany came however, in 1984, when I discovered Christopher Okigbo - whose name I had only come across on the very old cricket scorebooks at Umuahia, where he made a series of centuries in the 1940s. Okigbo's poetry was new and magical to me when I came to it. And that was when, I think, I began to take myself seriously as a poet. Nnorom: I share your experience of Biafra. I was born in July 1967 in the heat and heart of Biafra. You and I did not choose the best of times to come into this planet. The place of being a one-year-old when your country was plunged into a bloody 3-year war is clear as an influence on your work. You have also said that your poetic epiphany was the discovery of Christopher Okigbo who in fact has influenced poets such as Akomaye Oko and Obiora Udechukwu. Chinua Achebe has also likened the anger in the poetry of Olu Oguibe to that of Christopher Okigbo. Why is it so difficult to talk about post-1966 poetry in Nigeria without mentioning the name Christopher Okigbo? Obi: I was not quite seven months old when the first shots rang out on July 6, 1967, initiating the shooting stage of the Biafran war. That war claimed the poet, Okigbo, in the very early months. By the time he died, Christopher Okigbo had established a reputation as the most gifted poet of his generation - one which had Achebe in the novel, Soyinka in drama, and Okigbo quite pre-eminent in poetry. Somewhere in between all these was JP Clark. But Okigbo was absolutely the poet of that generation. People lament his death, mostly for cutting short a most promising poetic career, one which redefined modern African poetry - shifting from the classical, to the mystical, combining the mythic power of his Igbo culture, with the resonance of say, the Yoruba rara chants or Ewi poetry, and then proceeding in the last stages - in "Path of Thunder" - to inscribing the aesthetic of the public voice in modern African poetry. It is that kind of eclecticism, the catholicity of imaginative reference that makes Okigbo difficult to overlook. In actual fact, I think the best thing about Okigbo's influence has been said by the poet, Odia Ofeimun, who once said that Okigbo has knocked us all who follow him on the head. His influences abound - from the poetry of Pol Ndu, Okogbule Wonodi, Chimalum Nwankwo, Niyi Osundare, Obiora Udechukwu, or even the American poet, Jay Wright, possibly the greatest living lyrical poet out of America today, to the poetry of a more contemporary generation, including Oguibe, Uche Nduka, the late Sesan Ajayi, and numerous others who have be spawned out of the Okigboan experience. It is indeed difficult to deal with Okigbo, because his grip is claw-like. But I think in fact, that the mystique of his death, has thrown him up as the national poet worth celebrating - both in terms of the eternal prophecy of his poetry, and in the orgasmic beauty of its performance. Nnorom: In your view, has another poet come out of Nigeria who is, or can be as important in the development of poetry in Nigeria as Christopher Okigbo? Obi: Oh certainly, my generation is resplendent with poets and poetry. Esiaba Irobi, Uche Nduka, Olu Oguibe, Ogaga Ifowodo, Maik Nwosu, Onookome Okome, Toyin Adewale, Amatoritsero Ede, Lola Shoneyin, Unoma Azuah, Angela Nwosu, Remi Raji, the late Sesan Ajayi... too many people writing world class poetry. These chaps are redefining contemporary Nigerian poetry, and could be counted among the best of those writing in the world today, irrespective of the politics of publishing that have restricted them from an international audience. Nnorom: What is the extent of Okigbo's influence outside Africa? Obi: Immense. 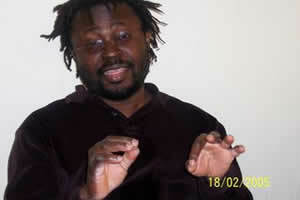 He is for one, the most anthologised of modern African poets. And he is quite inevitable if one must understand the transitions within African modernity and its poetics of social engagement. Okigbo has a central place. I've said somewhere else, that there are at least four poets of that generation from Africa, who will be counted among the definitive voices of all time: Okigbo, Senghor, U'Tamsi, and P'btek. Nnorom: If you are introduced as a poet to somebody and he asks simply what do you write about? How would you best sum up your body of work? Obi: What do I write about? Often there's a vital link between every writing and history, and society, and the compelling moments that seek clarity in the imaginative consciousness. I write about rivers and trees, the sea, the hills, of births and deaths, of transition. I write, borrowing the rapidly lost mystical world of the Igbo, and translating within it a contemporary regard for the condition of society: the contradictions of power, the tragedy of violence, such things. I also write about that part of my life that is pagan - my love of the sensual, the pleasure of the senses. Agwu afterall, is my creative avatar, and he loves wine and women. Nnorom: You won The Association Of Nigerian Authors/Cadbury prize for Poetry in 1996 with your volume of poems The Roped Urn. How has this affected your life as a poet? Obi: In 1996, the ANA/Cadbury prize paid N50,000. That was handsome enough to pay my rent in Lagos, and leave me quite enough for bottles of cognac and wine, for a little while. That is the only significant way that the prize has affected my life. Nnorom: Esiaba Irobi in his poem "Tamsin" suggests that poetry in essence should be a more performative art. Do you agree with this? Do you sometimes write a poem with a view to having it performed? Obi: I believe that each poem contains its own logic, and that there will be poets who declaim, as well as poets who seek introspection, and so have no need to declaim. There is thus, a difference between a poet like Jean Binta Breeze or John Agard, who perform their poems, and John Ashbery who does not. They all however seek to communicate an experience of value. I also understand Esiaba's need - coming as he is from the stage also: there's always that impulse for performance. And that is also good. I think the greatest excuse for poetry should be poetry itself. Nnorom: Nathan Lewis a poet who was my guest in November 2002 hinted that one the biggest challenges to young poets today is the rap/spoken word phenomenon. He argues that "These poets, and the others who just want attention, frustrate themselves and others who actually work hard at putting words together. It doesn't seem to me our craft should be tainted by the more sensational aspects of performance. Thus far, our craft has been able to remain the most pure in literature. This is a personal frustration of mine." Is this a problem? Obi: Quite frankly, I do not see the problem. If anything, I think we could sometimes borrow from the rap impulse, just as some modernist poets borrowed from Jazz, or pop, to show the rich resource of language that is available to the poet. Nnorom: You mentioned earlier in this conversation that African poets don't get the right publishing deals and exposure they deserve. Do you agree with some schools of thought that argue that the majority of African poetry does not survive translation, and this lack of universality short-circuits any interests in the International arena. Obi: The politics of publishing is critical. My analysis is that it is often the prerogative of the metropolitan press to promote what it finds most amenable, and to silence the rest. The argument is not really about translation: most African poets, for instance, write either in English, or Portuguese, or French. So it is not quite about translation. It is about economics. It is also about affirmation. It is about the narrow corridor in which publishing simply lives. It is also about something in the western consciousness that insists upon an assumption that poetry, literature, in fact, does not exist in Africa - only wars, and pestilence, and anarchy, and dictatorships. I think, the question is not about translation. It is about the selective rituals of international publishing and I think, its imperative of deliberately silencing the African side of the story in the late 20th century, (and early 21st c.) because it is a terrifying story - one which the rest of the world is too guilt-driven to hear. Nnorom: Suggest ways that young African poets can be given more relevance and pride of place in the global poetry environment. Obi: New African writers ought to come closer, identify each other, and begin to fashion a response to the conditions of writing in the continent - and in fact - in the rest of the black world. I think there ought of be publishing collectives, new ways of distributing and promoting new writers within the growing Diaspora, new journals and meetings of writers and scholars of new writing from Africa and the rest of the black world. That way, we'd give this some impetus. Nnorom: What other book or books are you working on at the moment? Obi: Oh, I completed a collection of poems called "The Horsemen and other poems." I have also completed the biography of the poet Christopher Okigbo which I'd been working on since 1988. I'm currently working on another collection of poems, a novel which I've been working on for quite a while, and a few other things. In fact right now, I'm making sketches and notes for a - play - a poetic drama based on an ancient Igbo myth around the futility of power. Nnorom: Mr Obi Nwakanma, thank you very much for talking to me, I have enjoyed this chat very much and have personally been instructed by it I hope that visitors to our site who will read this through this month and in the future will take away as much as I have. But just before you go, tell me, do you remember the first poem you ever read? Obi: I do not recall at all, but it must have been to a woman. Nnorom: I should have known that, Agwu afterall, is your creative avatar, and he loves wine and women.